What a lovely giant OLED TV you have! But it’s not good sat on the floor, is it? Doesn’t quite have the same gravitas when it’s stood at your feet rather than raised up on high, as any shrine to the gods of Hollywood should be. Thin and light TVs have made wall hanging a television far easier than it once was, but unless you’re going for a snazzy Samsung QLED set with their cable tidying One Connect boxes, they can still look a little unsightly on a wall. And that’s before considering getting the toolbox out and drilling into your walls to hang it. So hunting down a worthy TV stands is still a prime concern for movie fans, not just in terms of hiding all your connections away, but also to fit in with your home decor. Our selections take into account online reviews, brand reputation, product capability or unique features to help you pick through the maze of choices available to you. Best OLED TV: which top tech telly should you go for? We’ve scoured the wares of some of our favorite tech and furniture retailers to recommend what we think are the most lush-looking, or conveniently-designed TV stands out there. While we’ve not had hands-on time with these items, they’re either from reputable, fashionable retailers, or come very highly recommended according to customer review data. For the most part here we’ve stuck with stands able to support the standard large-sized TVs (between 55- and 65-inch) on the market, but do make sure to check your TV will comfortable sit on these pieces before splashing the cash. Check out our picks below. It’s hard not to like Made.com’s incredibly fashionable furniture, and the Esme TV stand is as attractive as anything else it makes. With open-fronted shelving you've plenty of space to put streaming devices and other TV gadgetry with ample ventilation, while there’s lots of drawer space too for tucking away DVDs and games. The curved edges soften the finish, while there’s a nice contrast with the white version as its paired with ash wood feet. An all-ash version is also available. Finding corner TV units can be tough, and finding one that’s attractive is even more difficult. The Max from Habitat ticks all the boxes though, slotting serenely into a corner gap, while also offering shelf space for your consoles and streaming boxes. It’s front-hinged door is a nice touch too, hiding away any unsightly gadgetry. Minimalist and simple, the Tyler stand from Habitat has a refined look and plenty of storage space behind its grained wood veneers. However, note that it’s not all that well ventilated, so if you’re storing gadgets inside they run the risk of overheating. You’ve been warned. Looking for something a little more rustic? Loaf’s Toot Sweet takes its inspiration from French window shutters with a beached timber finish. With drawers and cupboards either side of an area for your TV gadgets to feed their cables through it’s relatively functional too. Just note it might look better suited to housing an old black and white CRT to your flashy flatscreen. 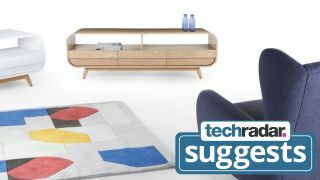 John Lewis has some very attractive, design-led pieces to place your TV on top of, with Tom Schneider’s furniture line our favorites from the store. The Taper 1400 comes in walnut or oak, and can hold a TV up to 60-inches in size. With cable-tidying back panel cutaways, shelving space and a neat curving design it’ll be a fitting centrepiece for your living room. Here’s another Tom Schneider special: the Surge 1350 is pricey, but it’s incredibly striking. Again available in oak or walnut finishes, it curves like a wave beneath your TV, ignoring the cupboard-like style of most TV stands. It’s certainly a case of fashion over function in terms of storage space, and let’s not even think about what else its price tag could buy you, but there’s no denying it’s a looker. If Santa Claus failed to get you the TV storage unit of your dreams last Christmas, let IKEA come to the rescue with its LAPPLAND TV stand. With ample shelving space, this giant stand will have plenty of room for consoles, streaming boxes, Blu-rays and trinkets. Just make sure your TV fits into that gap. Have a… LACK… of funds? Then the LACK TV bench from IKEA could be the no-frills option for you. At just £9 it’s little more than a pair of wooden shelves on legs. But It’s just right if you’ve only a small TV and a basic home cinema set up. And think how many bags of popcorn you can buy with the savings. Looking to keep it simple? The 1home GT4 glass stand comes very highly rated on Amazon, and is relatively affordable at £46.99 for the 100cm version (a mere £2 extra gets you the larger 120cm edition, it’s worth noting). With black tempered glass and room for TVs up to 62 inches in size, it won’t win any design awards but will get the job done on a relatively tight budget.